7th president - elected at the 1935 convention. Served one term. 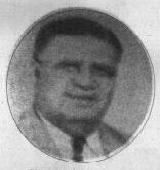 James "Jimmie" Tafolla was born in Bexar County on August 31, 1898. "His father helped start the struggle for recognition of Mexican Americans as Americans, during the time when it took real guts to stand up for your rights," as reported LULAC News. "Jimmie was one of those who in their youth literally pulled themselves up by their bootstraps. He is a worthy son of a worthy father; you remember, that old-line tradition of the 'chip off the old block'," reported LULAC News. Jimmy attended the San Antonio public schools and later graduated from the John K. Weber School of Law in San Antonio and passed his bar exam. He set up his private law practice in San Antonio and later served as assistant district attorney of Bexar County for many years. Jimmie was one of the best known attorneys, the 'dean' of Latin American attorneys of San Antonio from the standpoint of ethical and civic service to the community," reported LULAC News. The story goes that one afternoon a judge asked Jimmie why some Mexicans resented being called Mexicans. Jimmie replied, "Judge, I am going to give you a bit of back history," and then answered, "My great grandfather, my grandfather, my father, as I and my children, are native born American citizens. Five generations of native born citizens of this country. Now, do you think my children ought to be called 'Mexicans'?" The old judge just smiled and said, "I guess you're right, Jimmie."